This is the first in a new series showcasing successful restaurant, cafe or bar websites built with Theme of the Crop’s themes and plugins. Julie Brooks built a new website for the Bristol Bar & Grille in Kentucky, a multi-unit restaurant with five locations and a storied history going back to 1977. The restaurant is known for their Signature Dishes and each location has dishes unique to that location. They feature local farmers with special dishes and their manager is a master sommelier. After a productive relationship as their public relations firm, Julie’s company, Estes Public Relations, was given the task of creating a new, responsive website to promote the restaurant’s activities. 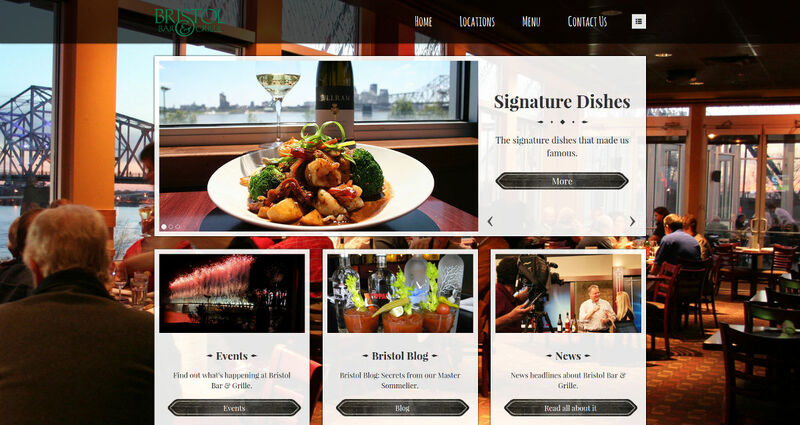 “I told my boss I would agree to build the Bristol Bar & Grille website, but only if they purchased a theme from Theme of the Crop,” said Julie. The Team Member Snapshots plugin that comes with CafeCultura was re-purposed for the restaurant’s Featured Farmers. They can showcase the farmer on the homepage slider and keep the blog for the restaurant’s sommelier to write about his wines. “Using the plugins that work with the theme are making it easy to manage their events and manage the content in a structured way,” she said. Thanks to Julie Brooks for being the first to take the plunge. Have you built a great site with one of my products? Let me know about it. WordPress plugins for what restaurants need. Not sure if it's the right fit for you? Get in touch.